This week we’ll discover Ireland. To give some perspective, this beautiful green country is about the size of the United States Indiana. The North of Ireland is owned by the British, which is technically a part of England. It is filled with vast valleys, hills and mountains, and beautiful coastlines. I myself have been to the country four times and intend of returning again. meone that didn’t speak English, the national language is Gaelic. Other common references to the language are “Celtic” or “Irish.” It is taught in schools and on every public sign, however it is spoken primarily in certain towns rather than across the country. The Irish are extremely proud of their language, as well as their culture. Therefore they are very welcoming to tourists who want to learn more about their country. Whether in a small town or a large city, you’ll feel the sense of community. An updated American passport. If you are 16 years of age or older, you must renew your passport every 10 years. If you don’t have one, an application usually takes about four-six weeks so make sure you put in it early enough. A passport costs roughly $140. Ireland does not take U.S. dollars, so make sure you convert your money once you get there to their monetary system, the Euro. Currently the exchange rate is not in our favor at around €1.34 euro for every American $1.00. *In the North, euro is accepted as well as English pounds. Book a flight. In the summer, traveling to Europe can be pretty costly. For example, an average flight in July for United Airlines from Philadelphia to Dublin is approximately $1,600. Booking a hotel will add to these costs. As well as any tours or day trips you may plan, food, and spending. Make sure you account for all of these expenses before deciding to travel to the appealing Ireland. They drive on the other side of the road, therefore you may not want to rent a car. Public transportation is very good across the country. Ireland’s largest city located southeast. It’s full of nightlife, museums, shopping on Grafton Street, good food, and a guaranteed good time. The city’s architecture is beautifully crafted and has commonly won the title of cleanest city. Dublin is home to the Guinness factory, as well rock band U2. It’s also home to the worlds largest St. Patrick’s Day Parade. Make sure to walk across the famous Millennium Bridge as well as visit Temple Bar. If you’re in the North, this is a must. It is a series of 40,000 basalt columns as a result of an ancient volcanic eruption. It’s on the coast of Co. Antrim and was named one of the natural wonders of the U.K.
Also one of the natural wonders of the U.K. and top of the list of Ireland’s number one tourist attractions. They’re located in Co. Clare on the southwest edge of the Burren (another must see) and visited over a million times a year. The peak height of these cliffs is approximately 702 feet. In recent years walls have been built so there is no danger of going too close to the edge. A smaller city of Ireland located on the west coast. It is full of shopping and food. While there, enjoy the small beaches and fishing in Galways Salthill. There, you feel a boardwalk atmosphere. It is commonly referred to as my Irish relatives favorite place to visit for its family environment. To get a feel for how the Irish celebrate, view this video from the Ellen DeGeneres show of her visit to Ireland for St. Patty’s Day! 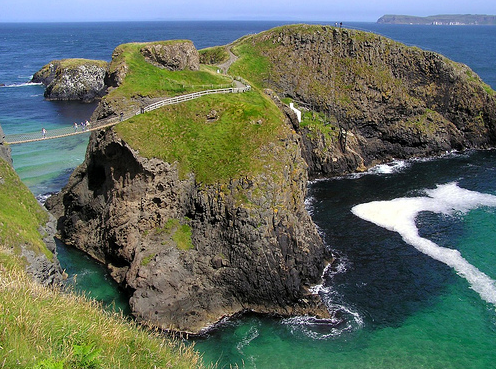 There are endless amounts of breath-taking destinations in Ireland. Check out as many cottages, castles, and landscapes as you possibly can. The people of Ireland make it feasible for tourists to get the opportunity to see these, with providing guided bus tour years round. Want to explore the rest of Europe while you’re over there? Ireland is only an hours plane ride to England. As always, safe travels!